Critics: Ruling Could Push Grizzly To "Brink Of Extinction"
A committee of state and federal agencies recommended this week that protection of the grizzly bear in the Yellowstone National Park area be lifted as soon as possible. The recommendation provoked an immediate outraged response from conservation scientists, who find fault with the committee's reasoning and question its motives. "Delisting would leave grizzly bears on permanent life support, and push the bear back to the brink of extinction," says Louisa Willcox, of the Center for Biological Diversity. There are about 1,500 grizzlies in the lower 48 states, including about 600 in the Yellowstone area, down from, says the U.S. Fish and Wildlife Service, about 50,000 in the early 1800s. The bear was once so common in California that it was chosen to grace the California state flag; the last California grizzly was shot in 1922. The grizzly was put on the endangered species list in 1975, and in Yellowstone, it was reintroduced and protected from hunting. The government set a recovery goal of 500 Yellowstone bears, and met it in 2007. Immediately, the FWS attempted to remove the bear's endangered species protection, but was defeated by conservationists. The argument in 2007 largely rested on the fact that Yellowstone grizzlies rely on the nuts of the white pine tree for protein (grizzlies have very different diets depending on where they live; Yellowstone bears primarily eat nuts for protein, British Columbia bears eat salmon, Alaskan bears eat moose and elk). Due to climate change, the white pine is disappearing rapidly from Yellowstone, along with its nuts, making it harder for the bears to source adequate protein. This week, the Interagency Grizzly Bear Committee, made up of several state FWS agencies, as well as several federal agencies, recommended a de-listing based on one study that suggests Yellowstone bears can eat berries (among other substitutes) to make up for the loss of the pine nuts. But, says the Center for Biological Diversity, that is merely a smokescreen. 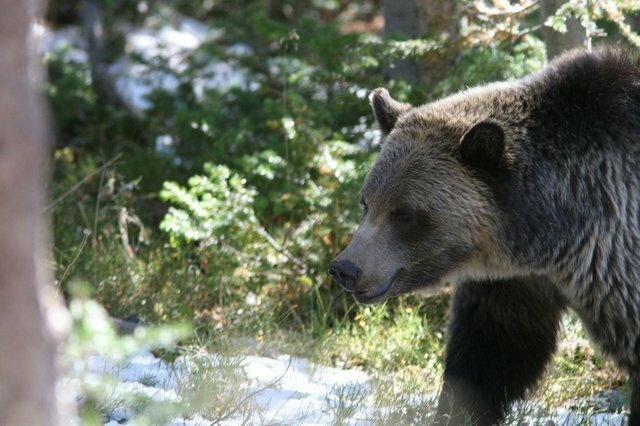 "The move responds to a major push by Idaho, Montana and Wyoming to take over management of bears and enact sport hunts, much as they have with wolves," said the CBD in a press release. Sport hunting of grizzlies represents a major source of income; in Alaska, where the bears are slightly more common and not as protected, a single grizzly hunt costs $11,000. At the meeting where the recommendation was given, Ken McDonald of the Montana Fish and Wildlife Service said, "The majority of funding for bear management right now has come from hunting license dollars," McDonald said. "Sportsmen have footed the majority of the bill on recovery. There are a few who would like to see a return on that investment." Legalizing hunting now, say some conservationists not employed by the government, would be dangerous to the bear's long-term prospects. "It is vital they make a full recovery so they don't slide back towards extinction," according to Bonnie Rice of the Montana chapter of the Sierra Club, in a statement. "Removing Endangered Species Act protections now could reverse decades of progress and erase the promise of full recovery." The Center for Biological Diversity also points out that allowing hunting would isolate bear communities, making it more difficult for the bear to avoid inbreeding. "The government is cherry-picking the data to get the result it needs to justify delisting," says Willcox. The recommendation is not a ruling; the federal Fish and Wildlife Service will merely take it into account before making a ruling, possibly as soon as late December. The ruling would go into effect in mid-2014. Conservationists plan to challenge the recommendation vigorously.